Due to the extended rainfall that most of the state saw during the planting window, Georgia’s cotton crop is extremely variable. Within close proximity or adjacent fields we can find blooming cotton next to 1 and 2 leaf cotton. Because of this variability, making any “one size fits all” PGR recommendation is impossible and any PGR decisions must be made on a field by field basis. So what do PGRs do? Contrary to what many may think, mepiquat does not cause the plant to produce more flowers or bolls. What is can do is limit the amount of vegetative growth which may enhance fruit retention in lower nodes. This early node fruit retention will help with “earliness” or a quicker maturation of the crop, which tends to benefit later planted cotton more so than early planted cotton. Excessive vegetative growth can also decrease harvest efficiency, decrease coverage of insecticides and fungicides below the canopy, decrease below canopy airflow (which may increase risk of foliar diseases and boll rot), and excessive shading of the lower canopy which can impact the fiber quality of bolls of the lower portion of the plant. When making decisions on a PGR management program careful consideration should be made on several key factors. The first and most important factor is current crop condition. Is the crop growing rapidly or is the crop stressed in any way (usually drought stress)? One way to determine the crop’s growing condition and growth potential is to look at the top five nodes and internodes of the plant. This is the region of the plant were current growth is happening, and any application of mepiquat will have an effect on. If internode lengths between the 4th and 5th nodes from the terminal are longer than 3” then this is a sign that the plant is growing vigorously and a mepiquat application is likely required. The rate of mepiquat needed is directly related to plant size and rate of growth. If pre-bloom applications are needed (usually only with an aggressive variety and under optimal conditions for vegetative growth) rates should most likely be between 4-8oz/ac. Early-bloom application rates may range from as low as 8 oz/ac up to 24 oz/ac if rapid plant growth is occurring and internode lengths are exceeding 3”. One often over looked aspect of the PGR program is the timing of the sequential application following the early-bloom application. It is important to continue to monitor the growth of the plant after application and initiate the follow-up application around 14 days after early-bloom. Remember that there is no “one size fits all” program and that these recommendations should only be used as a guideline. Every field has a unique variable and growers must look at the “whole program” and all of the “other factors” to determine what PGR program is best for their crop. What is the best source of nitrogen to sidedress cotton with? And are liquids better than solids? I get these questions all the time and there is not a real clear answer. It reminds me of cotton varieties, i.e. we have a lot of good ones but overall some may be better than others. Also, what works the best in one area or operation may not work the best in another. If you are using solid or granular N sidedress fertilizer your choice is basically between ammonium nitrate or urea. Neither of these contain sulfur so ammonium sulfate is often blended with them. Ammonium nitrate is less concentrated and usually more expensive. However, in research trial it out yielded urea and was the more consistent performer. Ammonium nitrate also has more burn potential than urea. Urea plus ammonium sulfate blends don’t always spread evenly and can “streak up” a cotton field. A relatively new fertilizer material, called Amidas (by Yara) is urea and ammonium sulfate homogenized and spreads very evenly. It is a 40-0-0-5.5(S) and is a little more expensive than the blend but performs very well. I have heard that some folks think that solids are not as good as liquids because they have to dissolve first. I don’t think this is true. However, there are some advantages to liquids over solids, namely that you can dribble them by the row and reduce the burn potential compared to spreading a solid over the top. One of the disadvantages of liquids is that you cannot cover as many acres as quickly as you can with solids. The two most common liquids are 28-0-0-5(S) and 18-0-0-3(S). Both outperformed their counterparts with no sulfur (32% and 19 %) in recent field trials. What about sidedressing with Potassium? If the full amount of potassium as recommended by soil testing is applied preplant or even soon after planting, then sidedressing K with N should not be necessary. With the heavy rains in late May and on deep sandy soils you may consider replacing some K that may have leached. Even then, it is difficult to sidedress with liquid forms of K in order to get enough. There are some liquid K formulations being recommended to add to liquid N sidedress but you are only getting very low amounts of K, in the neighborhood of 3 lb K2O per acre. Instead, on fields where you may have lost some K due to leaching I would recommend waiting until the cotton starts blooming and foliar feeding K with something like potassium nitrate. Boron – Our official UGA recommendation is to apply 0.5 lb B/a as foliar between first square and first bloom (the same window for sidedressing N). There are a number of products that recommend a lot less boron than this. For example, 6 oz/a of a 5 % B material only gives you 0.025 lb B/a. This would be fine if it was 10 or 20 times better than other products. But it is not. In recent field trials it’s effectiveness is very close to the untreated check. There are also many things added to boron fertilizers with claims they make the B get in the plant faster. Actually this may be true in some cases. However, boron by itself gets into the plant very well on its own, thank you. The Bipartisan Budget Act of 2018 authorized Seed Cotton as a covered commodity under Title 1 of the 2014 farm bill and created eligibility for ARC/PLC effective with the 2018 crop year. The legislation provides owners of a farm with generic base a one-time opportunity to convert the generic base to seed cotton base (option 1-A or 1-B) or base of seed cotton and other covered commodities (option 2) based on the 2009-2012 planting history. Landowners also have a one-time opportunity to update the payment yield used for seed cotton PLC. Producers on the farm must also select the ARC or PLC program for seed cotton. A lack of action to select the conversion option for the generic base by the appropriate deadline will result in default selections of option 1-A or 1-B, depending on which one results in a higher seed cotton base. Additionally, PLC is the default selection if no decision is made to select ARC/PLC. On April 18, USDA-FSA released Notice ARCPLC-50. This Notice provided the approximate timeline for the generic base allocation (conversion), yield updates, and ARC or PLC program election and enrollment. The table below summarizes the timeline. May 2018 All owners and operators receive their Notification of Covered Commodity Acreage History letter that includes all farms in all counties. Owners and operators are provided an opportunity to correct acreage history for years 2008 through 2016. Late Summer 2018 Owners make final base allocation and yield update decision for the farm. Late Summer 2018 Official 2018 Notice of Base Acre, Yield, and Election report mailed to all owners and operators on the farm, with appeal rights. PLC, ARC-CO, or ARC-IC program election for the farm. Ends September 2018 Annual enrollment into PLC, ARC-CO, or ARC-IC program for seed cotton base acre farms. On April 4th, 2018, China announced a potential 25 percent increase on import tariffs on major U.S. origin agricultural commodities in retaliation to a series of tariffs proposed by the United States. United States upland cotton is one of the commodities affected by this proposed increase in import tariffs. The export market is an important source of demand for the U.S. cotton industry. The United States is the largest cotton exporting country with around 71.3% of cotton produced in the U.S. exported last year. China is the second largest trading partner with the U.S. for cotton in 2017 and buys 16.7% of the U.S. cotton exports. The total value of cotton exported to China was worth approximately $976 million last year, which is the second highest value among all the other row crops after soybean. If Chinese tariffs are imposed on U.S. cotton, global cotton suppliers like India, Australia, and Brazil may experience a near-term opportunity to supply more cotton to China. In the short run, the market disruption could be a shock to the U.S. cotton futures market, particularly if hedge fund speculators sell off their long positions. However, the longer-term situation could see more U.S. exports rerouted to other cotton importing countries. This recent history of the change in China’s internal cotton policy suggests a similar reshuffling effect from a bilateral Chinese tariff on imported U.S. cotton. Chinese raw cotton import tariffs would continue to stimulate imports of duty-free yarn from Vietnam, Indonesia, and the Indian subcontinent. There was a time not too long ago when the most important disease we expected to find in Georgia’s cotton fields was “soreshin” or Rhizoctonia seedling blight. That disease is still important and we had a significant amount of it this year with the very wet conditions at planting. However, there are a number of other important diseases that cotton growers must deal with and NOW is the time that there diseases will become apparent. Weather conditions remain perfect for development and spread of disease; excessive wet weather in some areas, and our cotton crop is developing to a point where the foliage of the inner canopy is remaining wetter longer with high humidity, rainfall and irrigation. Also, as the crop begins to flower and as bolls develop, we are likely to find spread of diseases as well. Below are four of the most important diseases cotton growers in the state should be prepared for now. Unfortunately, there is little-to-nothing that can be done for three of the four. But recognizing damage and loss this season can help growers to make improved management decisions (variety selection, crop rotation, use of in-furrow nematicides, etc.) next season. Disease watch: STEMPHYLIUM LEAF SPOT on cotton is associated with a potassium deficiency in the cotton crop and CANNOT be controlled with a fungicide. I expect to see more Stemphylium leaf spot this year (characterized by red-yellow foliage and numerous spots with papery/gray centers with premature defoliation) because of leaching of fertilizer with heavy rains. My experience is that once symptoms begin to appear in the field, there is no opportunity for correcting the problem by foliar-feeding potassium, but this is a question better answered by Dr. Glen Harris. Stemphylium leaf spot typically occurs in the same fields and sandier fields on a regular basis. Disease watch: TARGET SPOT in cotton is expected because the season is shaping up to be perfect conditions with extended periods of high humidity with wet foliage and good growing conditions. Growers should begin scouting their cotton prior to first bloom and to consider fungicide applications as early as sometime between 1st and 3rd weeks of bloom if disease is detected or has been a chronic problem in the past. The disease is difficult to control because coverage is problematic in the interior of the canopy where the disease is first found. However, fungicide applications early in the development of the disease are critical if there is any hope to slow its progress where occurs. Not every cotton grower needs to treat for target spot; however every grower should be aware of the opportunity to protect their crop. The earlier target spot occurs in a cotton crop, the more likely significant yield loss will occur. Disease watch: Bacterial blight appeared early in 2018 and continues to be an issue; however reports are slowing of new finds. I expect with recent rains we will see a resurgence of this disease in the field. There is nothing to be done now to control it, but if bacterial blight is an issue in your cotton fields then you should consider other varieties in the future. Disease watch: Fusarium wilt of cotton is affecting younger and younger plants and seems to be spreading in the state, or at least our growers are becoming more aware of it. Fusarium wilt is characterized by smaller stunted plants showing foliage with clear striping and interveinal chlorosis. The vascular tissue of the plants is stained brown or dark. This disease is a “one-two” punch brought on by the Fusarium fungus and parasitic nematodes. Once the seed is planted, there is nothing to be done’ however recognizing the disease this season can help tp make aggressive, effective management decisions for next year. As a final comment, “vigilance” and “timeliness” are critical components for disease and nematode management in our cotton fields. Be observant and prepared to make aggressive decisions, either now or in the next season. For more information on any of the discussed topics please contact your local UGA Extension Agent. For more information about the conversion options for generic base, please refer to the factsheet Ag Policy Update within the Bipartisan Budget Act of 2018, available on UGA Georgia Agricultural Policy webpage. May planted cotton could have lost some pre-plant Nitrogen and Sulfur. What should we do? Consider early sidedress AND add 10 to 20 pounds of Nitrogen per acre if rain fall was enough to leach fertilizer. Also, add sulfur to sidedress nitrogen. Every field will have a different soil type. A lot of fields have long rows with many different soil types in the same row. Most leachable nutrients are Nitrogen, Sulfur and Boron. Potassium is not as mobile as Nitrogen. 2. What is the official timing window for sidedressing cotton ? First Square to First Bloom. We want ¼ to 1/3 N at planting and remainder at Side-dress. Solubor or “10% Liquid” for Boron. Stop Petiole Analysis after 8th week of bloom! According to the June 4th 2018 USDA NASS Crop Progress Report, 72% of the estimated cotton acreage in Georgia has been planted. This is up slightly from lasts weeks 62% estimate and well below the five year average for this date of 84%. Considerations for the Remainder of the Planting Season (Freeman) This spring has been especially challenging for cotton planting in many parts of the state. 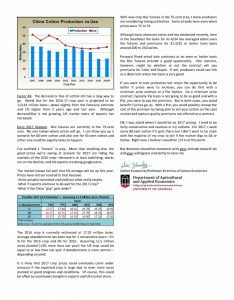 Dry weather early in the planting window followed by continual rainfall in the second half of May have delayed planting of over one third of the 2018 crop into June. Although yields tend to decreases as we move into June, there is still potential for strong, profitable yields. Listed below are some tips for managing a late planted crop. Consider increasing seeding rates. In late planting situations we want to shoot for a final plant stand of at least 2 plants/ft, so adjust seeding rates to aim for this desired plant population. Decrease any stresses. If irrigation is available, irrigate to promote stand establishment, enhance fruit retention, and eliminate stress during periods of dry weather. PGR’s. Mepiquat products should be applied to prevent excessive vegetative growth, decrease boll rot, and enhance fruit retention of lower position bolls which promotes crop earliness. Varieties. Varieties should be chosen on overall yield potential not maturity characteristics. Fertility. Decrease N rates by 25%-30% to limit excessive vegetative growth. This should be done with at-plant N and sidedress N.
Weather has certainly challenged the management program. The intense and often overwhelming rainfall in recent weeks has greatly limited our ability to be timely with weed management programs throughout Georgia. Below are a few discussion points to address common questions/concerns. Preemergence (PRE) herbicides in 2018 have been priceless providing excellent early-season control. Even after Palmer amaranth eventually emergences through the PRE herbicides, its growth has been slowed providing a more timely first POST application. For growers who removed the PRE from their system…………..horrible decision. As we move into June, the PRE herbicide is just as important as ever because weeds emerge and grow more quickly in June and July than in April or May. As always, apply two active ingredients that are effective on Palmer amaranth and get the rates right for your soil type and production practice thereby avoiding cotton injury. Postemergence (POST) herbicides are currently preforming exceptionally well in controlling emerged weeds; including Roundup and our labeled dicamba and 2,4-D products. It is worth mentioning that the performance of Liberty was hampered in late May because of consistently cloudy weather but since the sun has returned to South Georgia the herbicide is back to performing as expected and occasionally a little better than expected. Pigweed is big in many fields so keep in mind a systems approach including sequential POST applications and a layby containing products like diuron offer the best opportunity for success. CRITICAL to success is the time interval between your two POST applications; intervals vary within a given technology. Go to gaweed.com to view cotton weed management programs and intervals between POST applications (or call your extension agent)……….if you are off a few days between sequential POST applications it could have dramatic consequences. As mentioned above, herbicides are currently performing exceptionally well. Of course, that is good for weed control but it is not so great for cotton injury. 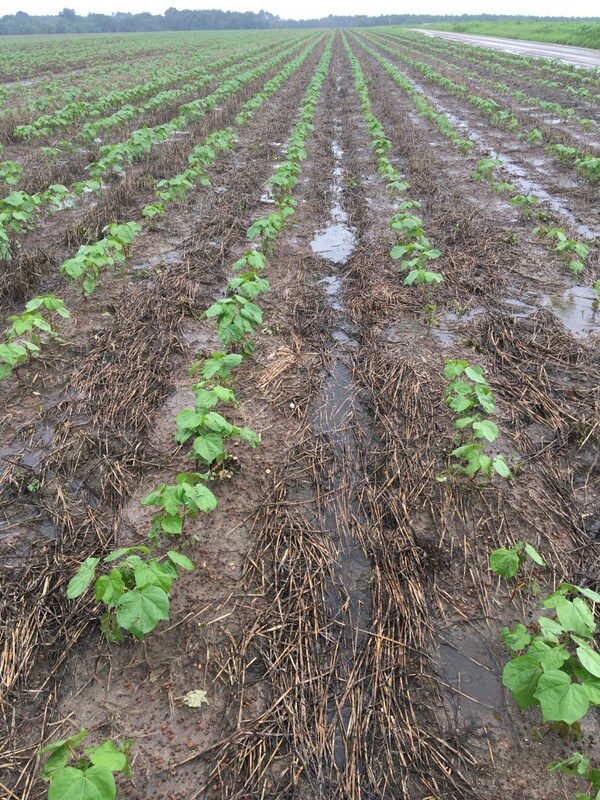 UGA research has consistently shown most cotton postemergence herbicide mixtures can cause twice as much injury when applied in saturated soil conditions as compared to ideal soil conditions. Don’t forget that research suggests that it is best to avoid herbicide damage to cotton past the 8-leaf stage if any way possible……yes, use the layby rig!! Thrips are the most consistent and predictable insect pest of cotton. We are all familiar with the stunted growth and crinkled leaves associated with thrips feeding. Excessive thrips damage will delay maturity up to 7-10 days which is unacceptable on late planted cotton. Historically thrips infestations are low on June planted cotton. Cotton planted in June also has rapid seedling growth which allows the plant to better tolerate feeding. Don’t assume thrips injury will be low in your fields as delays in maturity could have significant impact on yield potential. Aphids will infest most cotton fields during June each year. Populations vary from year to year and even field to field. We normally see aphid populations crash in July due to a naturally occurring fungus. On late planted cotton aphids may infest cotton in the seedling stage. Stress from aphid feeding on seedlings will slow development (delay maturity) which may limit yield potential of late planted cotton. Tarnished Plant Bug is a sporadic pest of cotton in Georgia. Plant bugs feed on small squares with needle-like mouthparts; damaged squares will be shed by the plant. Plant bugs can be sampled with sweep nets or drop cloths. Square retention should also be monitored. Our goal is to retain at least 80 percent of first position squares when entering bloom. Poor square retention will delay maturity and again have significant impact on yield potential of late planted cotton. Corn Earworm typically first infest cotton in mid-July. Corn earworm completes a generation in about four weeks. In recent years there has been much discussion about corn earworm and erosion of efficacy with Bt cottons (this is especially true in the Mid-South and North Carolina. Three gene Bt cottons are commercially available and will provide additional protection compared with two gene Bt cottons. Bottom line is to scout and use thresholds and be timely with insecticides if needed regardless of technology used. Stink bug infestations are typically higher in June planted cotton compared with April and early May planted cotton. Scout and use thresholds. Remember that the threshold is lower during the 3rd-5th week of bloom. Proper planter settings are critical for acceptable stand establishment, this is especially critical during years with adverse conditions. Very wet or very dry soil has a major impact on crop emergence. Caution should be exercised when planting into very wet conditions. From the planter mechanical perspective depth and downforce are most critical. It is very important that you check that you are not placing the seeds any deeper than 1 inch. Set this mechanically based on the planter manual and then check it in the field for all row units. Sometimes you will find slight variability between rows. Downforce should be reduced in very wet conditions compared to what you normally use. The poundage should definitely be less than 100 lbs. Check this in the manual on which slot to select if you have a spring downforce system, or set it utilizing your compressor or monitor if you have a more advanced system. If you notice that your presswheels are leaving a trench or appear to be compacting the soil reduce the downforce. This will cause problems with emergence and can cause crusting issues. Studies performed at UGA have shown reductions of emergence of up to 50% for improper depth and downforce settings when compared to proper settings. These problems are magnified when soil conditions are too wet. Lack of stand early in the season or delayed emergence will lead to other issues later in the season, such as weed, pest, and disease problems. These problems are translated to yield reductions at the end of the year. Please contact your local UGA County Extension Agent if you have questions about your planter settings. It seems like every time we get a lot of rain I hear people say “well, I guess I lost all my fertilizer”. While nutrient leaching (nutrients dissolved in water moving downward out of the root zone of plants) is a legitimate concern, especially on our sandy Coastal Plain soils of South Georgia, this statement is not exactly true. First, not all fertilizer nutrients are mobile in soil. Phosphorous for example is usually considered immobile and most positively charged elements or cations, like calcium and magnesium adsorb to the cation exchange capacity of the soil and do not leach readily. Most micronutrients are held by organic matter and/or pH and do not move. Therefore, nitrogen, sulfur and boron are the most “mobile” in soil. Even then, they have to be in the right form, namely the negatively charged nitrate, sulfate or borate forms. By the way, this is why most soil testing labs like UGA do not routinely test for nitrogen, sulfur and boron in soils. They are considered “transient”, i.e. they can be there one day and (after a big rain) not be there the next. Oh, and what about potassium? Potassium is more mobile than phosphorous but contrary to some current thinking, it is NOT as mobile as nitrogen, sulfur and boron. So the next question is “how much fertilizer do I need to put back”? There is no easy answer to this question because it depends on which nutrient, which form of nutrient, how much you put out, what soil type (i.e. how sandy) how much rain you got etc. But let’s for example take the case of cotton fertilized in South Georgia before the heavy rains in May this year. Hopefully most growers followed soil test recommendations and put about 30 pounds of nitrogen, 10 pounds of sulfur and the recommended P and K at planting. The P didn’t move much at all, the K may have moved some but it is likely still where roots will get it eventually. So that leaves N and S. Even if you lost half of your N and S you would only have to replace 15 pounds of N and 5 pounds of S. This can easily be done at N sidedressing time between first square and first bloom. Boron can be foliar fed any time before first bloom. Our recommendation is for 0.5 lb B/a and can be tank mixed with herbicide or growth regulator sprays. Bottom line is look to maybe sidedress on the earlier side, replace about 10-20 lbs N/a and include S with your sidedress N.
Due to the heavy late-May rains, a higher percentage of Georgia cotton is going to be planted late, in June, this year. The tendency is to think “hey its late, I need to rush this cotton so I am going to put higher rates of N out at planting”. This is actually the opposite of what you should do! While it is always important to get off to a good start, if you get off to TOO good of a start with extra N at planting, you could interfere with the “vegetative/reproductive” balance and reduce yields. In other words, you want the plant to shift from vegetative (“growing stalk”) to reproductive (flowering/fruiting) as quickly as possible (as early as 5 nodes) since there is not as much time to flower and put on fruit before frost. So how much do I reduce my N rate by and when? On page 76 of the UGA Cotton Production guide, it is recommended to reduce your total N rate by 25-30% . It is not stated, but I would recommend taking some off of both preplant and sidedress applications if possible. So instead of roughly 30 lb N/a at planting and 70 at sidedress for May planted cotton for a total of 100 lb N/a….consider 20 lb N/a at planting and 55 lb N/a sidedress for June planted cotton. If you put out 30 lb N/a in early May before the rains and don’t plant until June, you still should have about 10-20 lb N/a available so could just plan on an early N sidedress. 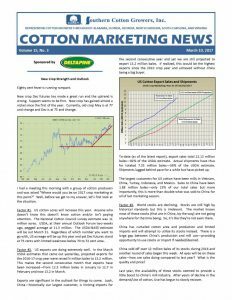 Below is an article written by Don Shurley, cotton economist, about the cotton market. We will be having our Cotton Production meeting tomorrow night at 6 with Dr. Whitaker, cotton agronomist and Dr. Roberts, cotton entomologist. We will also be offering a Pesticide One on One Training. This will benefit applicators who will be spraying the new technology. The presentation will be short and anyone attending can earn an extra pesticide credit for the meeting. Please call the office if you have any questions at 229-333-5185. 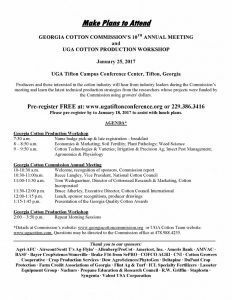 Georgia Cotton Commission’s 10th Annual Meeting & UGA Cotton Production Workshop will be held in Tifton, GA on January 25th at the UGA Tifton Conference Center. Late registration and sign in begins at 7:30 am and the meeting will start at 8:00am. Below is a schedule for the day. Five row crop and vegetable production meetings are currently scheduled in Lowndes County. Commercial (cat. 21), and private pesticide credit will be given with each meeting to all license holders who attend and sign in. Please call the office (333-5185) a few days ahead if you plan to attend so that plans can be made for the meal. I look forward to working with you this year and please contact me if you need anything. Don’t let your license expire put these meetings on your calendar now. Posted in Cotton, Disease, Peanut, Pesticides, Soybean, Vegetables.